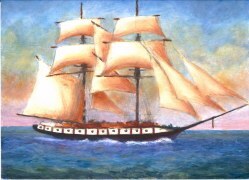 The Brig Niagara illustrates the optical illusion of receding only one step in the spectrum. The sails are painted in orange with receding yellow highlights. Yellow recedes only one step from orange but the sails could not look more dimensional. The other 4 steps were used in spectrum order across the painting in order to create an optical illusion of depth starting with green in the foreground, to blue, to violet, to red on the ship, to orange on the sails, to yellow on the sails, to green in the ocean background. The sky contains another cycle of the spectrum starting with red at the horizon. By assigning spectrum order colors to successive picture planes, as above, the artist insures chromatic aberration by the viewers eye lens where light rays bending at successive angles behave like distance angles and are perceived as an optical illusion of depth. 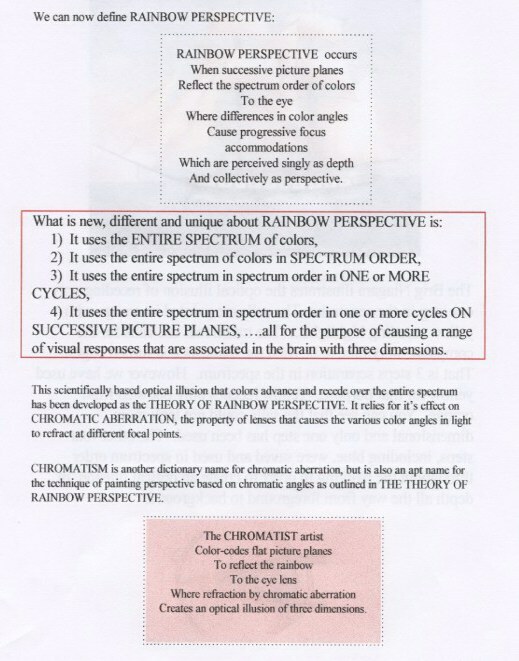 Perceived visual effects such as color advance and recession, complementary and simultaneous contrast, pulsation, (and associated after-images) result from phase, amplitude and frequency modulation of color wavelengths as they are passed by chromatic aberration from the eye lens to focus options on the retina.